In 1974, the United States Mint continued offering the uncirculated and proof 40 percent silver Eisenhower dollars that had proved so popular during their first few years of issue. 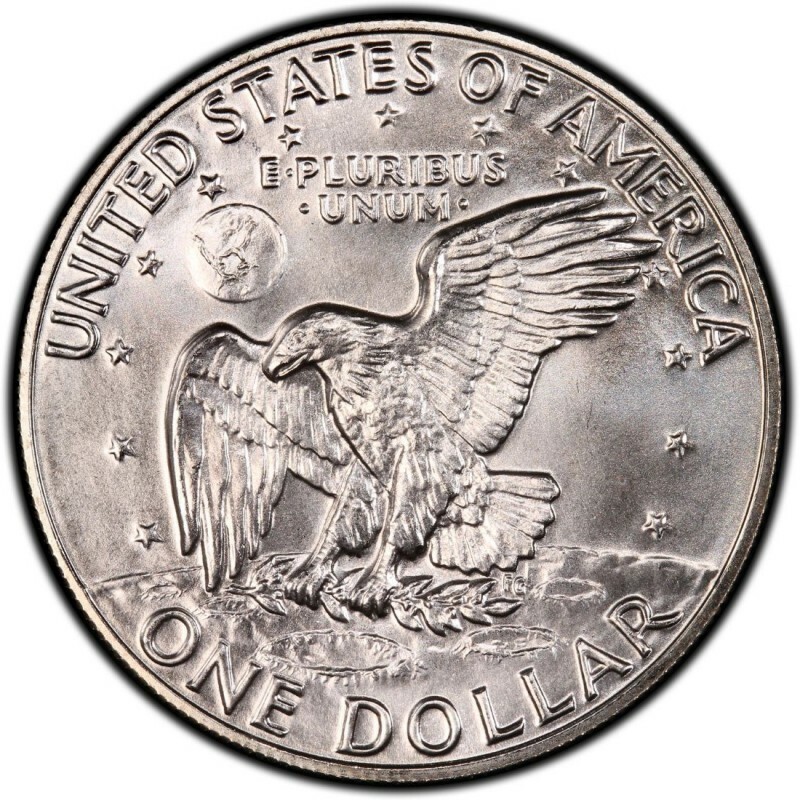 This silver dollar coin, designed by Frank Gasparro, shows a bust of Dwight D. Eisenhower on the obverse and an eagle clasping an olive branch while landing on the surface of the moon. The coins commemorate the passing of President Eisenhower and the landing of the Apollo XI, both of which occurred in 1969. There were a little more than 3 million silver Eisenhower dollars struck in 1974, with 1,306,579 uncirculated pieces and 1,900,156 proof specimens, all of which came from the San Francisco mint. Both pieces are worth around $11 each when the spot price of silver is about $20 per ounce. 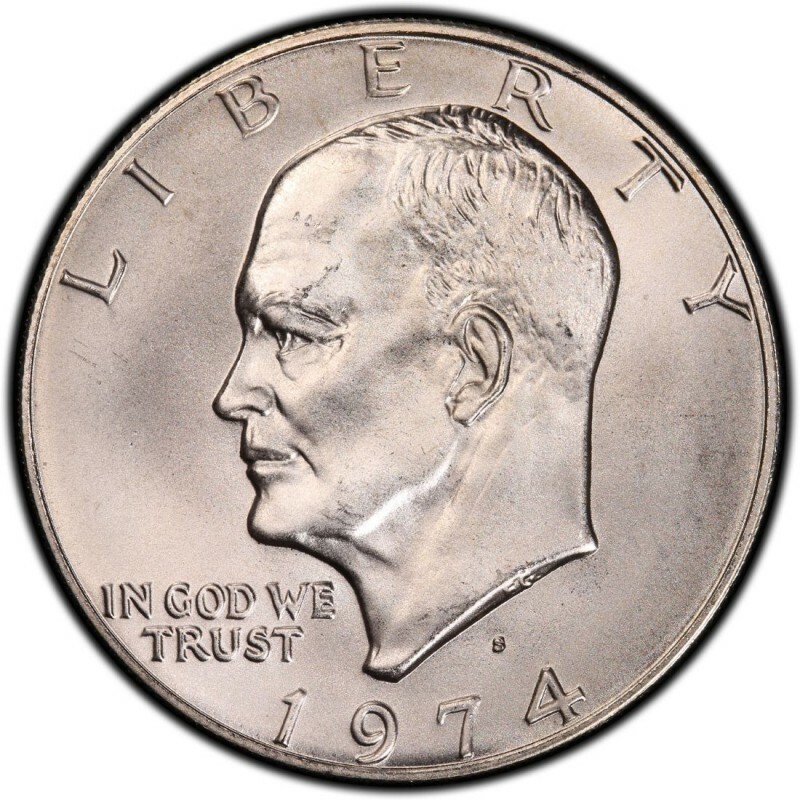 1974 Eisenhower silver dollars are widely collected by numismatists who assemble complete date-and-mintmark sets of the dollar coin, though there are many bullion investors who have also purchased 40 percent silver Eisenhower dollars to include in their portfolios. Most coin collectors will go the extra distance and seek out Eisenhower dollars that have the fewest contact marks and flashy, white color. These are the hardest Eisenhower dollars to come by and certainly among the scarcest. If you seek high-grade Eisenhower dollars, be sure to purchase them in slabs from highly reputable, third-party coin grading companies. *There are no 1975-dated Eisenhower dollars; those made in 1975 bear the 1776-1976 dual dating in commemoration of our nation’s bicentennial. I have a 1974 Dwight D Eisenhower (one dollar) with copper around the edge. Any value?? Your "copper around the edge" comment means that your Eisenhower Dollar is most likely the copper-nickel variety. You could also look for a mintmark. Silver Eisenhower Dollars were only struck at the San Francisco Mint, and thus have a small "S" just beneath Eisenhower's neck (see the photo at the beginning of this article - it is an "S" Eisenhower Dollar). Unless your coin is in exceptional condition, if it is not silver-clad, it is unlikely that it is worth much more than its face value. Non-silver Eisenhower Dollars in mint state do have some collectible value, but any copper-clad Eisenhower Dollar with signs of being circulated is unlikely to net you any money. I have a 1974 Eisenhower Dollar with no mint mark. The piece is very shiny and in good condition, with a few minor scratches. Does this coin have any value? Silver Eisenhower Dollars were only minted in San Francisco. Your non-silver Ike Dollar in circulated condition would probably not be worth much more than face value. I have a 1974 eisenhower coin with an "s" mark just above the 74. . Still shiny.. any value? If you have two 1974-S Eisenhower dollars, they're either clad proofs or 40% silver. Clad proofs are worth about $3 to $4 each, while 40% silver specimens are priced around $6 to $8 each. I HAVE A 25$ ROLL OF THESE EISENHOWER DOLLARS, BUT EACH END OF THE ROLL HAS THE EAGLE, SO I DON'T KNOW WHAT YEAR THEY ARE, WAS AFRAID TO OPEN THEM, IM ASSUMING THEY ARE UNCIRCULATED WAS AFRAID IT WOULD MESS WITH THE VALUE. DO YOU THINK ITS OK TO OPEN, TO FIND OUT THE YR.
Amanda, you will be forced to open the roll to check the dates. Imagine if they have been rolled with different coins on the inside. For your curiosity and for checking resale value you will need to open the roll and check all of the coins. The packaging is pretty much a formality at this point. What's valuable is inside adn there might be some surprises.